In the parking, transportation, and mobility profession, world-class performance is recognized as the ability to transform obstacles into opportunities, and visions into notable achievement. This takes dedication from consummate professionals who can skillfully combine cutting-edge technology with traditional craftsmanship. The profession is built on merit and IPMI proudly salutes and encourages that spirit and determination with its annual IPMI Awards of Excellence. Every year since 1982, the IPMI Awards of Excellence competition recognizes world-class examples of design and program innovation. All entries considered each year (facilities and programs) have contributed to advancing the parking, transportation, and mobility profession. Projects may be submitted by architects, engineers, consultants, or other primary members of the project team with the owner’s permission. For descriptions and project details, please download the criteria below. Nominations are accepted on an annual basis and judged by a select panel of judges representing architects, parking consultants, and city, airport and university officials on the IPMI Awards of Excellence Committee, and honored at the annual IPMI Conference & Expo. The 2019 awards competitions are now closed. Be sure to join us in honoring our award winners at the 2019 IPMI Conference & Expo, June 9-12 in Anaheim, Calif. The awards submission process will open again this fall – stay tuned for more details! 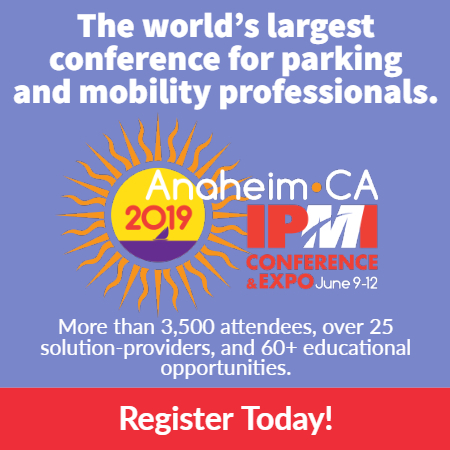 For more information, contact IPMI at aoe@parking-mobility.org.